USTA-Wyoming assisted Wyoming Indian Elementary School (WIES) in receiving an ICON grant from USTA Serves. Dave Boon, USTA-Wyoming executive director, has made three trips to WEIS and conducted training for both their PE teachers, as well as three other individuals who are running the Kids Tennis Club. The PE classes will reach all 350 students at the school and the Kids Tennis Club, which had 55 kids sign up, is off and running. "The kids are having a BLAST!" Boon said. Dave visited the school again on the last day of the Kids Tennis Club, right before the students got out on summer break. USTA-Wyoming's D&I funding provided each student that participated in the WEIS Kids Tennis Club with a new racquet and foam balls. 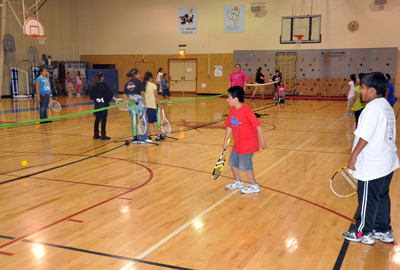 As a result of the efforts at WIES, USTA-Wyoming is now working with three other elementary schools on the Wind River Indian Reservations including Ft. Washakie Elementary (357 students), Arapahoe Elementary (326 students) and St. Stephens Mission (224 students) to implement tennis in their PE programs and to develop Kids Tennis Clubs at their sites. These three schools combined with WEIS serve 1,200 Native American 10 and Under students! Another highlight from Dave's adventures was discoving that Sacajawea's grave (yes, the famous guide of the Lewis and Clark Expedition) is located just west of Wyoming Indian Elementary School on the Wind River Indian Reservation. "This was a great surprise to me and something of significance in U.S. history, right here on the Wind River Indian Reservation in Wyoming!" Boon said.